On August 15, Treasury Secretary Steven Mnuchin took a day trip from Washington to New York City that cost $15,000. And it was quite a day -- Mnuchin stood by President Trump for a memorable Trump Tower press conference about Charlottesville. The president, who had initially planned to speak about his infrastructure plan, quickly veered off script. There were "very fine people" on both sides, Trump said, discussing a rally of white supremacists and neo-Nazis that left one counter-protester dead. The New York trip was one of seven flights Mnuchin completed on military jets. It was detailed in a report released Thursday by the Treasury Department's inspector general. According to the report, Trump requested that Mnuchin join him that day in August at Trump Tower to discuss tax reform and tariffs. The meeting was initially scheduled for Bedminster, New Jersey, where the president has a golf property, but was later relocated. Mnuchin took off from the Andrews Air Force base in Maryland on a C-37A jet and flew 179 miles to Teterboro Airport in New Jersey. Transportation Secretary Elaine Chao and budget director Mick Mulvaney joined him on the way up. Just before 4 p.m., Trump stepped out of an elevator into the gilded lobby. To his left stood Chao, while Gary Cohn, Trump's top economic adviser, stood with Mnuchin to his right. 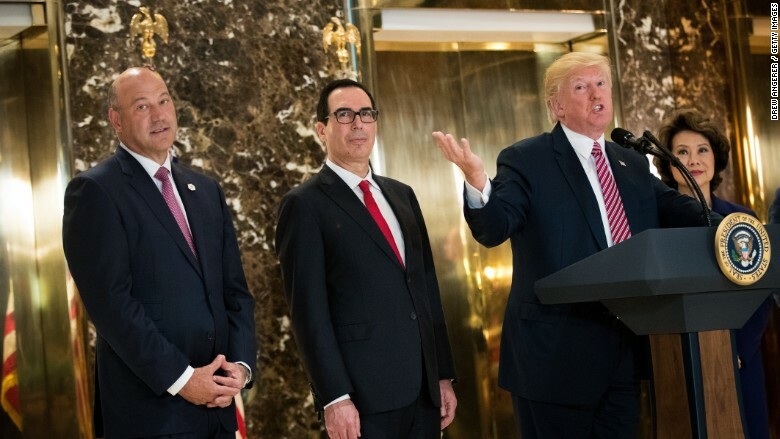 Treasury Secretary Steven Mnuchin stands next to President Trump as he doubled down on his claim that "many sides" were to blame for violence at a rally of white supremacists in Charlottesville. What followed devolved into a heated, off-the-cuff tirade about how the media portrayed Trump's reaction to what happened in Charlottesville. The president doubled down on his earlier claim that the violence in Virginia was perpetrated by "many sides." "What about the 'alt-left' that came charging them? Excuse me. What about the alt-left that came charging at the -- as you say, the alt-right? ... Do they have any problem? I think they do," Trump said. Mnuchin flew back to Maryland later that day in the same C-37A plane -- this time without Chao and Mulvaney. He was planning to hold a classified phone conversation with Secretary of State Rex Tillerson, and "the others lacked the necessary clearances that would have allowed the Secretary to speak openly," according to the records reviewed by the IG. In all, the trip cost the Air Force $15,112.50. Taxpayer costs aside, it was a messy episode for Mnuchin. In a letter circulated later in the week, Mnuchin's Yale classmates called upon him to resign. "We call upon you, as our friend, our classmate, and as a fellow American, to resign in protest of President Trump's support of Nazism and white supremacy. We know you are better than this, and we are counting on you to do the right thing," the letter read. Mnuchin issued a statement in response that reasserted his commitment to the president. "I don't believe the allegations against the president are accurate, and I believe that having highly talented men and women in our country surrounding the President in his administration should be reassuring to you and all the American people," he wrote. Since then, Mnuchin has avoided conversations about Charlottesville, even as Cohn publicly expressed his unease with the president's statements. Before long, Mnuchin was batting away questions about a different controversy: his frequent use of military jets for both domestic and international trips. 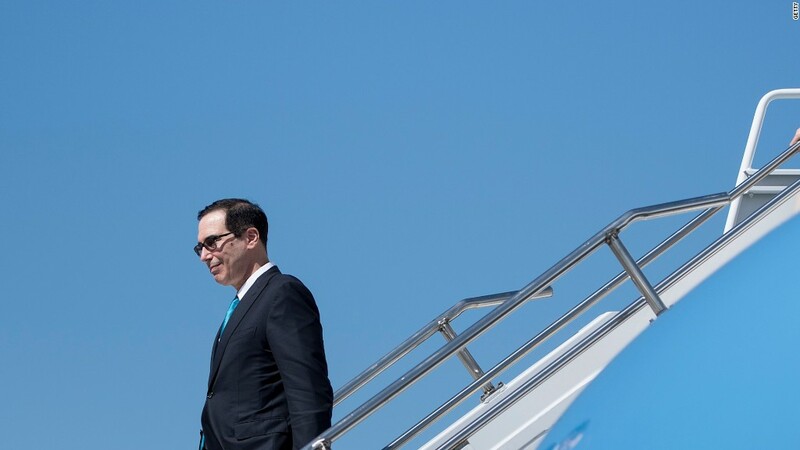 An August 21 excursion to Kentucky first drew attention after Mnuchin's wife, Louise Linton, posted a photo to Instagram that showed her stepping off a government plane. Linton's caption, in which she boasted of her designer wardrobe, sparked outrage on Twitter. But the conversation ultimately shifted to the propriety of the trip, which coincided with the solar eclipse, and to Mnuchin's preferred modes of transport. Before long, news broke that Mnuchin had requested a government plane for his August honeymoon to Great Britain, France and Italy. The request was later withdrawn. "Let me be clear: I'm very sensitive to the use of government funds," Mnuchin said in September when asked about his trips at a Politico event. "I've never asked the government to pay for my personal travel, and this was purely about alternatives of how I'd be able to be involved for national security."